I received the bad news on Wednesday afternoon (31st August) that Ray Fisher had died at 11am that day. Ray's death is not unexpected, but it's still very sad news. I'm extremely glad that I made the effort to go up and see her a week and a half ago. Ray was born in Glasgow into a musical family of seven children in which everyone sang. Ray and her brother, Archie, initially played skiffle but then took up traditional American songs. In the late 1950s, Norman Buchan, a teacher and folklorist who later became a Labour MP, started the Ballads Club in Glasgow, attracting many young singers and musicians who were eager to learn more about traditional songs, among them Ray and Archie. Through him and his wife Janie, Ray met the great Scots traditional singer Jeannie Robertson, who, after hearing her sing, invited Ray to stay with her in Aberdeen for six weeks to learn about her songs - which began a lifelong friendship with Lizzie Higgins, Jeannie's daughter. 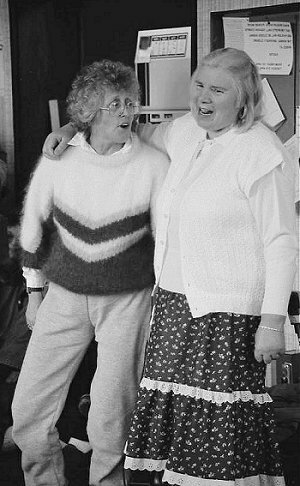 While at Jordanhill teacher-training college in the late 1950s, Ray started a folk club and joined her brother and Bobby Campbell, a singer and fiddler, in a trio called the Wayfarers. Ray and Archie were then asked to make regular appearances on Here and Now, an early-evening magazine programme on Scottish Television. Ray was now being booked to sing all over Britain. On one trip, to Newcastle upon Tyne, she met the fiddler and Northumbrian piper Colin Ross, whom she married in 1962. That year, she was also part of Arnold Wesker's Centre 42 project, touring the country with other singers, and was subsequently asked by A L Lloyd to sing on his album of industrial folk songs, The Iron Muse (1963). Having moved to Tyneside, Ray began to give more solo performances, concentrating in particular on the big, traditional ballads. She loved finding different versions of those songs and, where necessary, reconstructing the stories, making versions that were entirely her own. Ray made several albums, though fewer than would be expected of a singer who was so widely admired. She said in one interview: "I don't feel the need to put things on tape. I don't feel the urge to record anything. I'm amazed by the number of albums that people have made in the time that they've been singing � I'm not interested in what posterity has to say about what contribution I've made to folk music." She never pushed herself forward or sought bookings, being content to take the gigs that were offered. Ray is survived by Colin and their children, Fiona, Andrew and Duncan.